1. Melinda Etzold Studio/Gallery... 219-7280 - 4332 Donnybrook, 79902, 603-6622 melindaetzold@gmail.com www.MelindaEtzold.com Description: NEW: Coloring page packages featuring Melinda's whimsical work! Paintings in oils, pastels, watercolors & encaustics. originals, prints, cards, mouse pads, aprons, & coasters. Animals, still lifes, landscapes, religious and more. Directions: At the corner of Mesa & Brentwood, go up Brentwood & turn Right on Stanton. At next stop sign turn Left on O'Keefe. Go up the hill & turn Left on Donnybrook. 1st house on the left. 2. Francisco Romero...873-0357 - Romero Art Studio 109 Argonaut, Apt. 103, 79912 Guest Artist: Daniel Padilla yucaromero@msn.com Description: Figurative art. Directions: Get on Mesa & drive towards the Montecillo Apartments. The studio is located in between Castellanos & Festival, within 500 ' of Mesa. There is a big mural painted outside of the building where my studio is located, which is in the El Paso Repographic building. 3. Carmen Navar Art Studio & Gallery... 833-4635 - 6320 Falling Star 79912 Guest Artist: Richard Cadenhead mysticart@aol.com www.carmennavar.com Description: Original mixed media in oils, acrylics, pastel,watercolor, encaustic. Crosses, printed art cards, jewelry. Richard Cadenhead Photography. Directions: Get onto Westwind heading North. Turn Left onto first Northwind. Go down 3 streets. Turn right at 2 story house. On Right, Mex. pink house. 4. Cheryl L. Kilian-Hofer...433-9344 - 5857 Via Cuesta Dr. 79912 El Paso Mudlady Guest Artist: Terri Wenner ckilianh@gmail.com Description: Handmade slab work potteryfunctional art. Bowls, trays, 3-dimensional wall hangings, masks. Guest artist: Wheel thrown, high fire pottery. Directions: Mesa to Belvidere. Take Belvidere to the top. Left on Via de la Paz, go one block, then Right on Via Cuesta. Go to the top of the hill and just as the street starts down the hill, the twostory bluish grey house on the right. 6. Krystyna Robbins Studio/Gallery 584-0953 - 5070 Yucca Pl. 79932 krystyna_robbins@sbcglobal.net www.krystynarobbins.com Description: Oil paintings: large variety of sizes & prices including miniatures, retablos, & prints. Pastels & watercolors. Directions: Take Mesa west from I-10. Go past Doniphan. Mesa becomes Country Club. Turn Right on Yucca (about ¼ mile west of Doniphan.) Go almost to the end. 5070 on your right. Will be a sign "Private Road." 7. Nina Eaton...630-3013 - 506 Shadow Willow Dr. 79922 Guest Artist: Catherine Waterhouse elpnina@elp.rr.com ninaeatonphotography.com www.shadowdogdesigns.com Description: Digital photography of favorite places in El Paso & the area. 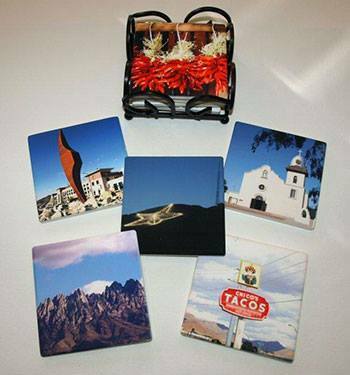 Photo gifts include coasters, mouse pads, magnets, trivets, prints, canvas, note cards, Christmas ornaments and more. Catherine: Nature inspired jewelry using semiprecious gemstones, sterling silver, copper & more. Directions: 5 Minutes from I-10. Mesa St. Left on Doniphan, Right on Sunset, Left on River Bend, Right on Turnstone, Left on Wild Willow, Right on Shadow Willow. Second house on the left. 8. Rami Scully Studio/Gallery...584-4773 - 4130 Boy Scout Ln. 79922 ramitom@earthlink.net www.pleinairpaintersofelpaso.com Description: Most of my paintings are done starting on site, out of doors & finished in my studio. I attempt to express the color & spirit of each location, flower, or animal, using acrylic, oil or pastel media. Besides originals, I have prints, cards & cups. Directions: Going downhill (West) on Sunland Park, turn Right (North) on Doniphan. At the next traffic light, Turn Left (West) on Frontera. After crossing a large irrigation ditch, turn Right on Boy Scout Lane. 4130 is the 7th house on the Right. 9. *Terry Wright Studio...731-6730 - 630 Gary Lane, 79922 Guest Artist: Stephanie Romero www.terrywrightstudio.com stephanieromeroart@yahoo.com Description: Mosaics made from tile, broken dishes, beads, etc. Outdoor mosaic tables & sculptures. Mosaic classes taught in the studio. Stephanie: Sultry Desert Eyes- SR Designs. Handmade jewelry, clay figures, paintings and more. My art is fun, colorful, and a bit out of the ordinary. Directions: Exit I-10 at Sunland Park, go toward the race track, turn Right on Doniphan, Left on Frontera, Right on Boy Scout, Left on Gary Ln. Third house on the left. Sounds like a great tour! Wish I could be there. Hope the weather is great for this spectacular event! Congrats - and have a great time! Wow! 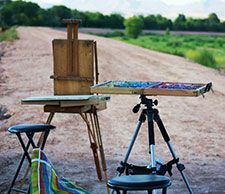 This studio artists tour in El Paso sure sounds like terrific fun! Congratulations on being invited as a guest artist with your beautiful jewelry! :) Best to the El Paso pup from pal Le Gonze!